Is this cereal flavor good enough to replace breakfast? That classic sugary milk flavor leftover after eating two or three bowls of your favorite frosted cereal – topped with a handful of raspberries for good measure. It you’re a big fan of clean, low sugar cereal vapes, V’Nilla Milk and Cereal may just have what you need! I picked up a bottle of Milk and Cereal V’Nilla at a local vape shop a few weeks ago. I really like what they did with the label. The background is simple and colorful, the text is extremely easy to read, and everything is evenly spaced out. The vertical style text display adds to the label appeal as well; I feel like I could pick a bottle of V’Nilla out from a group 100 other similarly sized e-juices, and that’s saying something! A delicious fruit and cereal paired with V’Nilla’s famous sweet and creamy milk. That classic sugary milk at the bottom of a bowl aroma upfront, with some slight hints of raspberry or strawberry in the foreground. A set of homemade claptons wrapped around a homemade drill bit (2.5mm I believe), installed on the deck of the twisted messes squared RDA – airflow shutdown 75% or one square. Pulsed on my Titan V2 from Silver Steam Vapors. Front – Notes of a dense cream or milk upfront. It’s almost a one on one match with the real thing except for a slight vanilla bean note on the back-end. There are some subtle hints of a mixed berry at this point as well, but I could not make out the variety. Middle – More of the same sweetened cream or milk flavor. I’d compare the Milk and Cereal flavor to a frosted flakes that’s been sitting in milk for just a few minutes. Raspberry has definitely been added to this mix for authenticity; but they berry flavor comes off as more of a fresh fruit instead of an artificial cereal berry (hopefully that makes sense). This liquid was not as sugary as I thought it was going to be, which makes for quite a clean vaping experience. End – A lot of the same flavors finish this one off. There’s nothing super exciting going on with Milk and Cereal, but what is present is very easy to relate to. I found myself having mini flashbacks of sorts, back to my middle school days, sipping the sugary milk left over after a bowl of sweetened cereal! Aftertaste – No lingering at all. This is quite unusual for a cereal vape to; V’Nilla did a great job keeping the sweetener to an absolute minimum. Nothing spectacular coming from this 70/30 blend. Even with my dual clapton setup and the unregulated Titan, the cloud production was a bit disappointing. The flavor more than makes up for it though! Would I recommend this to a friend? Absolutely. This one contains all the sweet cereal and milk flavor you could ever want minus the sugar high you get after. ADV? I can’t believe I’m saying this to be honest. 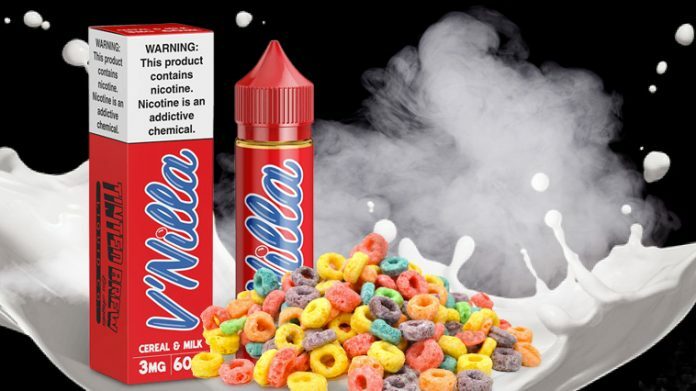 I haven’t found a good cereal vape that I really liked in a few years. But this one is a definite all day vape for me!